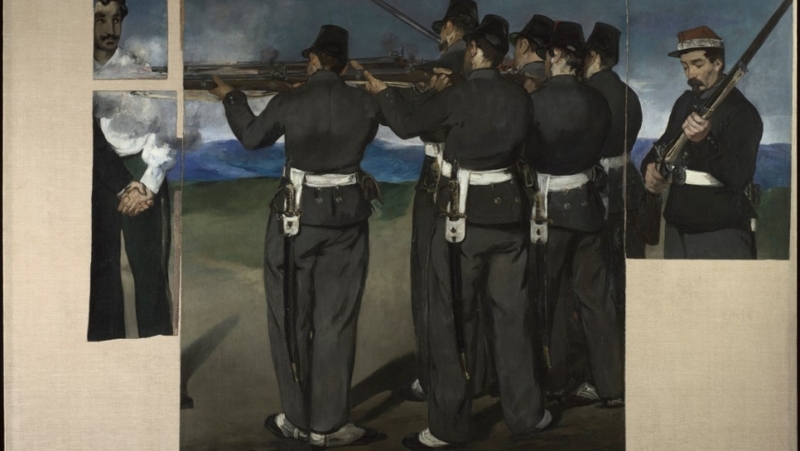 Edouard Manet (1832–1883) The Execution of Maximilian about 1867–8. Oil on canvas 193 x 284 cm. The National Gallery, London. The Execution of Maximilian __depicts the fatal moment when the young Emperor Maximilian of Mexico, abandoned by the French colonial forces that had installed him there some three years earlier, was shot alongside two of his generals, Mejía and Miramón, on 19 June 1867. The left hand section of the canvas was lost during Manet’s lifetime. After his death it was cut into smaller fragments, some of which were sold off separately, eventually to be reassembled by Edgar Degas. The painting has been part of the National Gallery Collection since 1918. This important painting – presented at the Mead Gallery as part of the National Gallery Masterpiece Tour __– forms the centrepiece to a specially curated exhibition of works by some of today’s greatest artists from across the world. Together they speak of the way the past is represented to us, and of the personal stories at the heart of violent events which are either lost or – like the image of Maximilian’s hand clasping Miramón’s – can only be glimpsed. The National Gallery Masterpiece Tour is sponsored by Christies.